Babe's Boat Care KitBabe's Boat Care Kit contains all the essentials you need to keep your boat looking new. Includes everything you need to wash, clean, and protect your boat. All Babe's boat cleaners are environmentally safe and easy to use. This kit is perfect for new boat owners and makes a great gift! Includes16 oz. 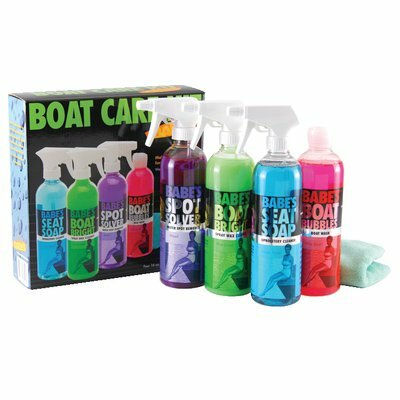 bottles of the following: -Babe's Boat Bright Spray Wax Cleaner - This non-abrasive formula is designed to clean and protect various surfaces on your boat. Features UV Protectants and leaves a water-repellent barrier. -Babe's Seat Soap Upholstery Cleaner - Use Babe's Seat Soap Upholstery Cleaner to clean your vinyl, plastic, and leather surfaces. This cleaner is specifically formulated to lift dirt, scum, and suntan oil without harming or drying out upholstery surfaces. -Babe's Spot Solver Water Spot Remover - Babe's Spot Solver is specifically developed to remove hard water spots from your boat's surfaces. For use on all gelcoat, glass, and chrome surfaces, and because there are no abrasives, Spot Solver will not harm gelcoat or other hard surfaces. -Babe's Seat Saver Upholstery Conditioner - Babe's Seat Saver is designed with UV protectants to condition and protect your marine vinyl upholstery. Use this after using Babe's Seat Soap Cleaner. -Babe's Boat Care Kit also includes an Extreme Performance Microfiber Towel. If you have any questions about this product by Babe's Boat Care, contact us by completing and submitting the form below. If you are looking for a specif part number, please include it with your message.